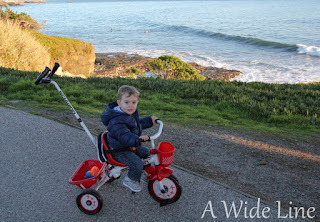 Riding by the ocean on his new trike in December. Not about the too much stuff part. Quinn did get way to much stuff. But, with just one or two exceptions, Q actually plays with everything he got for Christmas. Which has made for a couple very pleasant weekends since. Here’s a list of Q’s new favorite toys – toys that actually get played with every day. Bookmark this list for next year or for your next toddler birthday party. You’re welcome. if Amazon still has that deal going on. Quinn loves these books by Tony Milton and Ant Parker, which I also refer to as “A Study Guide for Boy Moms.” We read them at least three times a day. (Quinn can finish every line in each book already!) 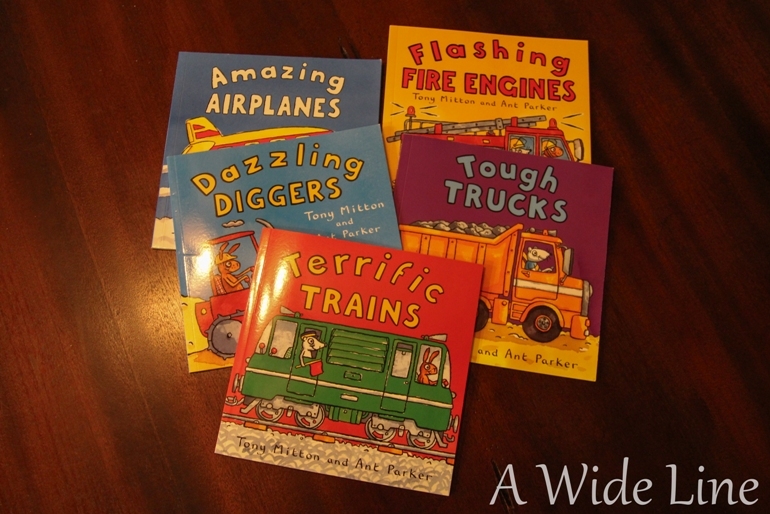 Luckily, they’re short, easy reads. I bought our first one, Amazing Airplanes, before our flight to Michigan last summer (another MODG recommendation), and Q loved it. So I bought him four more for Christmas. They’re only $3.99 each on Amazon. Either way, I’m getting the rest of the set for Q’s birthday. Quinn loves his new trike. I like it because you can strap him into the seat and it has a removable handle for an adult to push and steer. The only problem is that Quinn can also steer with the handle bars, so sometimes we suddenly veer to the right or left. But Q loves it, and it’s really easy for you to steer with the handle. Quinn loves this train. It has a set of seven interchangeable blocks with letters and songs that teach kids all the sounds of the alphabet. He plays with it all day long and names all the letters on the blocks. This comes with a barn, a farmer and five animals. Quinn likes to move the animals around inside the barn. His favorite thing is to drop them into the hole at the top of the silo and then open the door at the bottom to get them out… over and over and over. Last night, it was a good thirty tantrum-free minutes of entertainment, which in toddler time, is the equivalent of about four hours. Same goes for this airplane. It comes with a pilot and two passengers, and it sings a little song and makes plane noises. I hear the song in my head while I sleep. It started out with me making the towers and Q knocking them down, but now he builds them too. One of the sets he received was the CAT Dump Truck, which is big enough to hold almost all his toys. 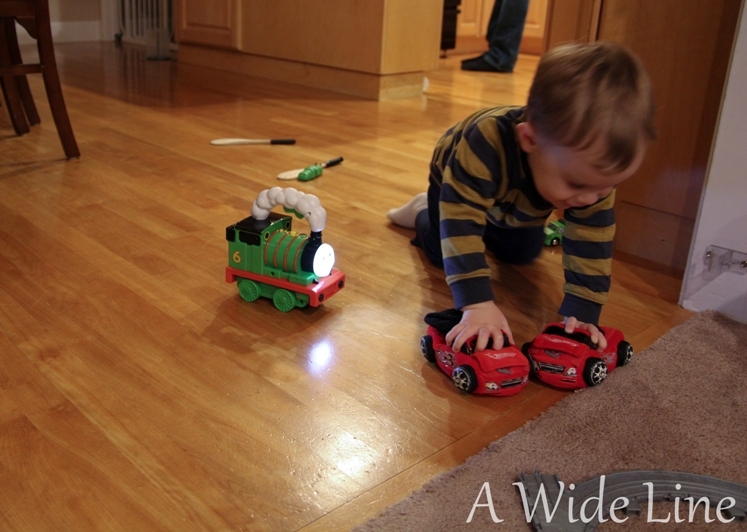 He pushes it around the house, collecting things along the way. Toddler. Boy. Nirvana. 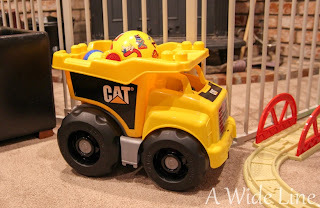 These trucks are super cheap at Target (way cheaper than at the above link!!). I got Q the dump truck, fire truck, tow truck, roller and bulldozer for his stocking. They’re just simple, wooden toys, and he LOVES them. They sit on the table while he eats and they go with us in the car. 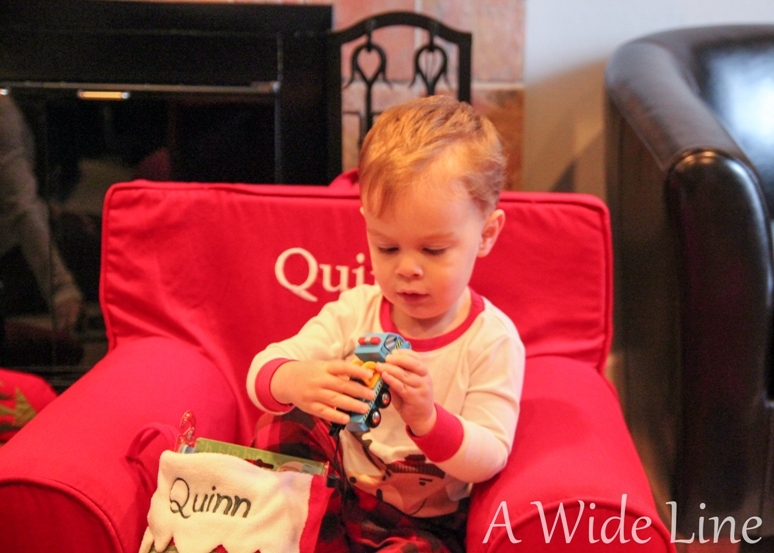 Quinn sits in his new, red, Q-sized chair and plays with toys, watches TV and eats snacks every day. He likes to point and name all the letters in his name. For the price tag, Q better f**king love this chair. He better take it to f**king college with him! Q’s favorite Thomas and Friends friend is Percy, and he got four different Percys for Christmas. (I won’t tell you how Q pronounces “Percy,” but suffice it to say that his Percy toys do not come out with us in public.) This particular Percy lights our way down the hall to the bathroom for Q’s bath every night. My incredibly clever mom got Quinn a gift card for “Saw-bus”. Now Q can have all the over-priced milk with a green straw that he wants. Now, Hubs and I can make dinner much quicker in the evenings while Q occupies himself with his sea of new toys. This will come in very handy when Hubs goes on his 2013 World Tour (what I’m calling his extensive upcoming business travel). Any guilt I feel about Q having too many toys is drastically outweighed by my need for sanity and a few minutes of peace and quiet. omg! i kinda feel like a horrible mom! maybe eliana would be more entertained around home if we got her some good toys! 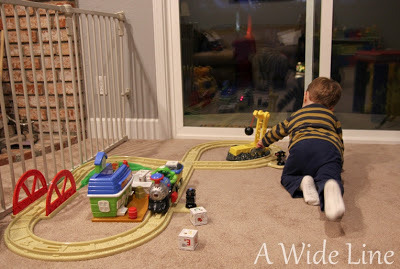 I love that trains and Little People are still so popular! Who needs computers when child's imagination works just as well!